This topic contains 0 replies, has 1 voice, and was last updated by Eric Shade Avenged June 3, 2018 - 01:54. 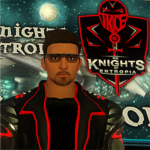 This thread is in place to notify our members of Entropia avatars that have been blacklisted by The Knights of Entropia society. This list includes any Entropia avatar that has been flagged by the community (or dismissed from TKoE) for scamming, begging, or other “bad behaviors”. The OreBuyer Express Repeatedly refused to split item in shared loot.